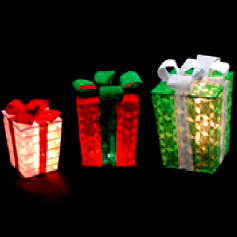 The Holiday Light Store can repair and refurbish your old wire frames. 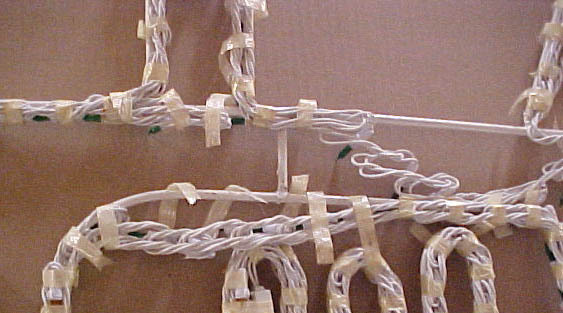 Unfortunately frames that were assembled with tape, like the picture above, do not last but a short time before they begin to look ragged and lights fall out of place. We will strip your frames completely down, sand the frame to remove all rust and re-paint the frame with Rustoleum Paint. Powdercoating is extra. After the paint is cured, we will install our clipped on lights with your choice of colors. Your displays will look brand new and will look good for years to come! Our rates are very reasonable. We normally do this only Jan-July. We only refurbish frames that are made with round steel that will hold our clips.